The Compound Bow Rest and Holder is the ideal companion to the Lock-a-Draw draw keep (lock). It holds the bow out in front of you while waiting for game and it takes the weight of the bow and your arm while shooting. It steadies the bow like a shooting rest does for a rifle. For those who through age or disability have trouble holding a bow steady at the end of their arm, the Bow Rest greatly increases accuracy. A drawn bow with an arrow nocked is very awkward to hold while waiting for game. This picture illustrates the problem. One could turn the bow so it sits on your lap, but who wants a loaded bow pointing at their stomach? Clearly a hanger of some sort is required. With a hanger you would still have to handle the awkward drawn bow to get it in position to aim and fire. The movement involved would surly spook any game. The Compound Bow Rest and Holder is the ideal holder because the bow is held from the riser and is fired while resting in the bow rest. The bow rest takes the weight of your arm and bow, and steadies the bow like a shooting rest does for a rifle. Although the bow can be accurately fired without taking hold of the hand grip, you have much more control of aiming if you hold the grip. How would you rather hold your drawn and loaded bow for hours while waiting for game, on your lap as in the upper picture or in the bow rest? Very little movement is required to fire this bow, just grab the handle, aim and fire right in the Bow Rest. Since the bow is held from the riser under the upper limb pocket, the Bow Rest does not affect the trajectory of the arrow. When using the Compound Bow Rest and Holder the lack of movement and greater accuracy due to the steadying effect guarantees that you will increase your bowhunting success. The Compound Bow Rest and Holder is fully described at www.bowstabilizer.net. It can be bundled with the Lock-a-Draw for reduced price on this web site. 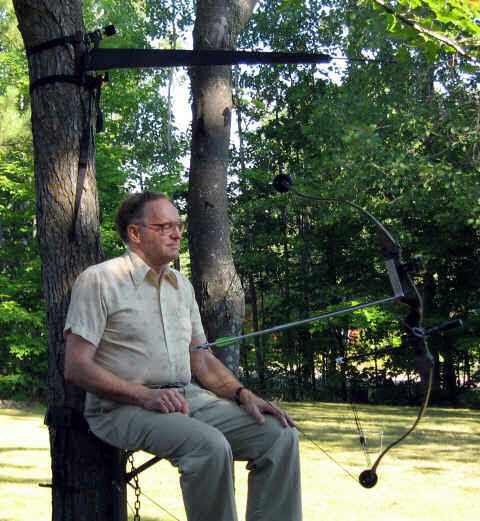 The Bow Rest may not be convenient for target practice because of lack of a convenient tree to hang it on. 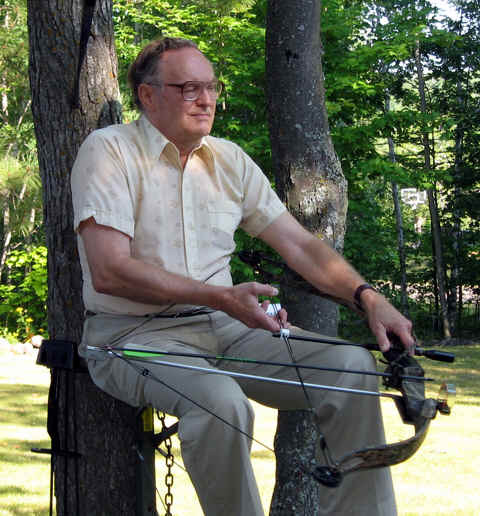 An alternative stabilizer for the bow which is appropriate for target shooting is the shooting stick. Instructions on its use are found at www.crossbowalternative.com/stick.htm.